Learn to make a Sámi-inspired leather bracelet, a distinctive jewelry style that developed in the Sámi's northern nomadic culture. Reindeer are important to the culture and the traditional jewelry incorporates softened reindeer leather and sculpted antler. All levels of skill are welcome at this class! Please be sure to tell the person registering you if you are a beginner or a returning student so the instructor can prepare accordingly. 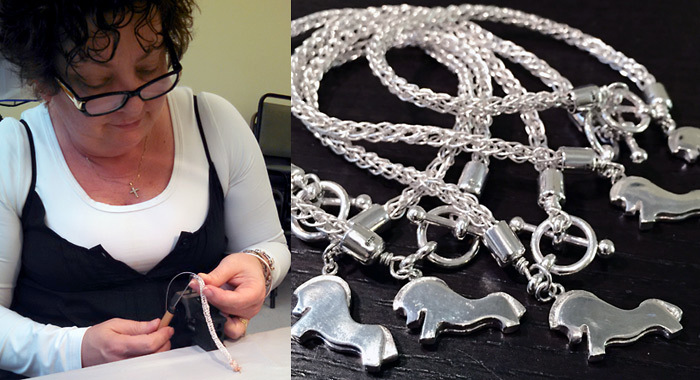 Beginners will explore the traditional jewelry techniques of triple braiding, coiled pewter wire, and sewing the finished braid to a softened reindeer hide strip. A reindeer antler button finishes off the bracelet. Class fee is $50 and is payable to Ingebretsen's. The materials fee is $95 and is payable to the instructor. Advanced students will create a wide, multi-braided bracelet with a variety of braids and coils. The class fee is $50 and payable to Ingebretsen's. The materials fee is $125 and is payable to the instructor. *This class will be held at Norway House, 913 E. Franklin Ave. Minneapolis. 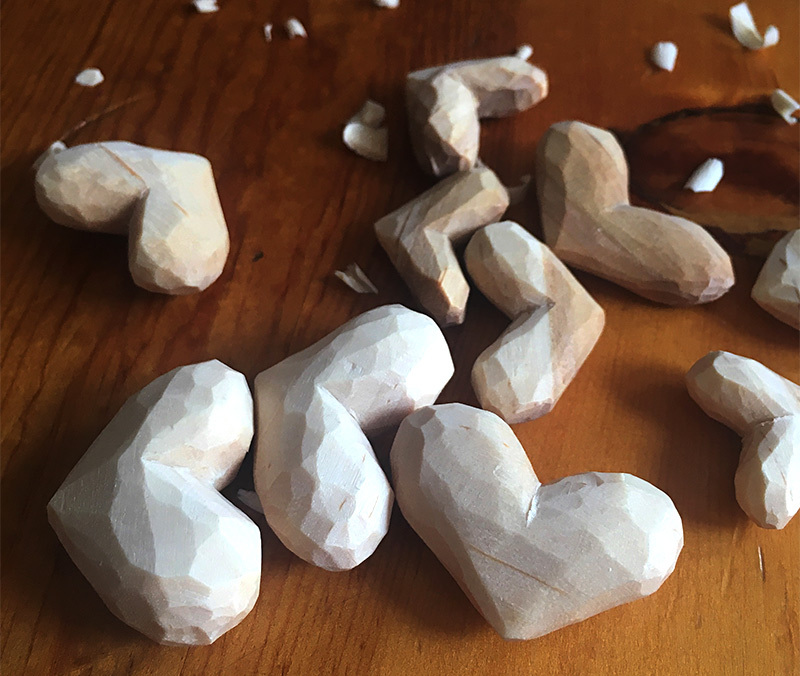 Carvers Erik and Michele Vevang will introduce you to spoon carving in a relaxed setting with all supplies, including cut-resistant gloves, provided. You will start with a wooden blank and learn how to shape it into a spoon with a variety of carving strokes and then how to finish it. The wood used in this class is locally sourced, taken from fallen branches, tree trimmings, and trees that had to be felled. About the teachers: Erik and Michele Vevang's woodcarving is influenced by their Scandinavian and Germanic heritage. Both have degress in art, Erik from St. Olaf and Michelle from UW-Stout. They have studied at North House Folk School and with Fred Livesay, who is also an Ingebretsen's instructor. 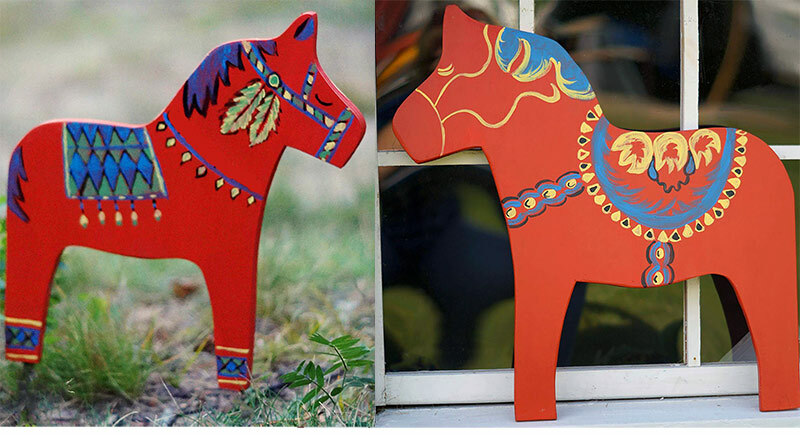 Wooden Dala horses started out centuries ago as childhood toys and have now become an iconic symbol of Sweden. In this class, you will unleash your creativity and paint an individualized 2-dimensional 24” high-quality pine plywood Dala horse. Ideal for hanging on a door, over a fireplace or on a garage/barn or boathouse. The artists of DIYdala, Jason Patalonis, Kristine Peterson, and Sarah Johnson will guide you through the painting process. All the materials are provided for the class. Whether you are an art novice, home crafter or skilled painter, all levels are welcome. The best part of this experience is there is no one style or right way to paint our Dala horses. Horses are sanded and painted in your choice of background color and come ready to decorate. Choose from traditional orange, Falun red, Swedish blue, yellow, white, green or black. Please note your color choice when registering. Students are encouraged to research and think about possible patterns and color combinations prior to class. Take a look at DIYdala’s Instagram page or browse Internet sites for inspiration. Time will be devoted to basic brush stroke practice and a brief overview of Swedish dalmålning painting. You will also enjoy a traditional Swedish fika of coffee, almond cake, and sandbakkels while you paint. Registration deadline is Saturday, April 27 to allow instructors to prep the horses. Additional kits to take home so you can add to your herd of Dala horses will be for sale on the day of class. This year, give your mother a Dala horse handpainted by you for Mother’s Day or give her an early gift and take the class together! $60 plus a $15 material fee paid directly to the teachers. Materials include either stakes for putting your competed horse in the garden, or a chain and hook for hanging it. You may want to bring a sack lunch or enjoy a late lunch after the class at the many restaurants along East Lake Street, including the Midtown Global Market. Some of the most fascinating objects demonstrating medieval man’s craftsmanship have come from Viking burials of the 9th and 10th centuries in Sweden. The term “posament” refers to a method of knotting and braiding wire into ornaments used to decorate textiles. In this class students will practice the art of posament using nylon cords to perfect either a “Josephine” or triangular series of braided knots. 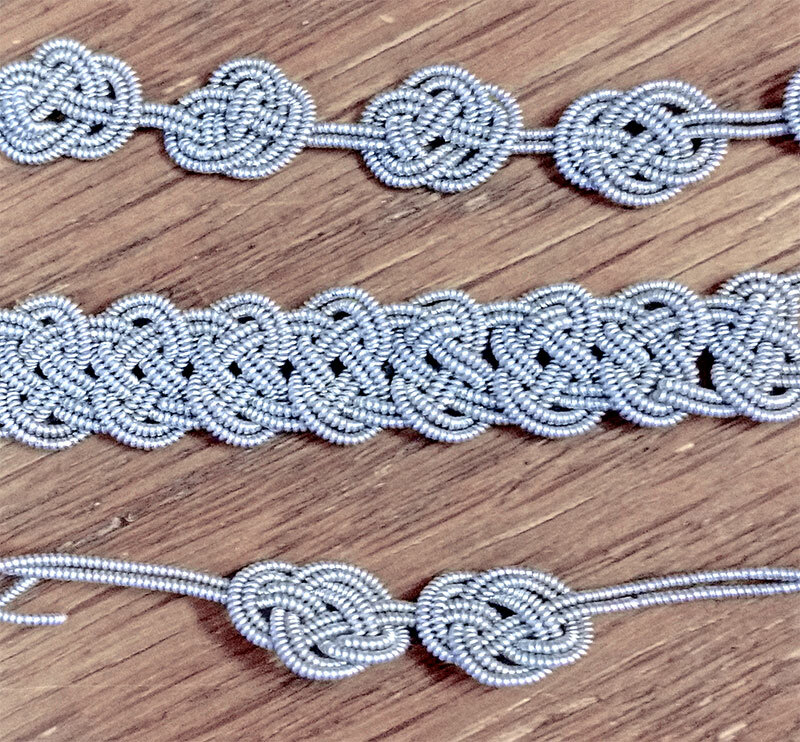 We will construct a length of knots using pewter coiled thread (96% tin + 4% silver) and sew the finished braid to a softened leather strip to create a bracelet. A pewter button finishes off the bracelet. $65 with a $95 materials fee paid directly to the instructor on the day of class. 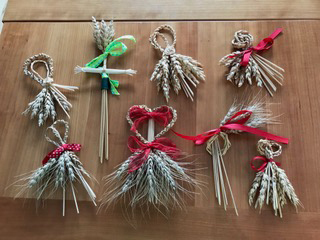 Traditionally, braided (“woven”) wheat was used to welcome spring and to give to a favorite fellow or girl! Today the fun “knots” serve many purposes, but can still welcome spring by being placed on a door, can serve as a small gift for a friend, or can adorn a table as a napkin ring or favor. In this class you will learn the basics of wheat preparation for weaving, and several plaits (braids) for a variety of designs. You will then twist them into the pattern you like and create a favor or door decoration (or two, or three…) from wheat to adorn you or your house for spring! The wheat is supplied. $35 with a $10 materials fee paid directly to the teacher.